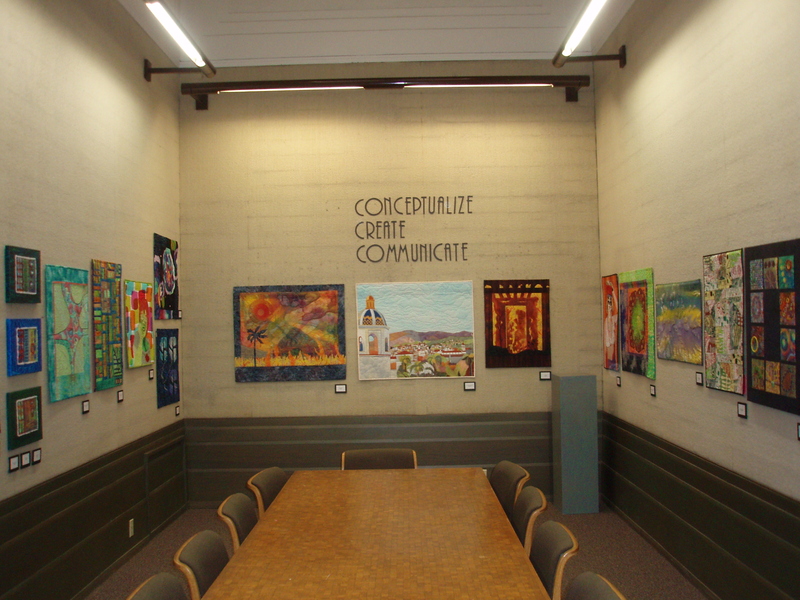 Here is a preview of a show that Jeanne Surber, Judy Rys and I just hung. 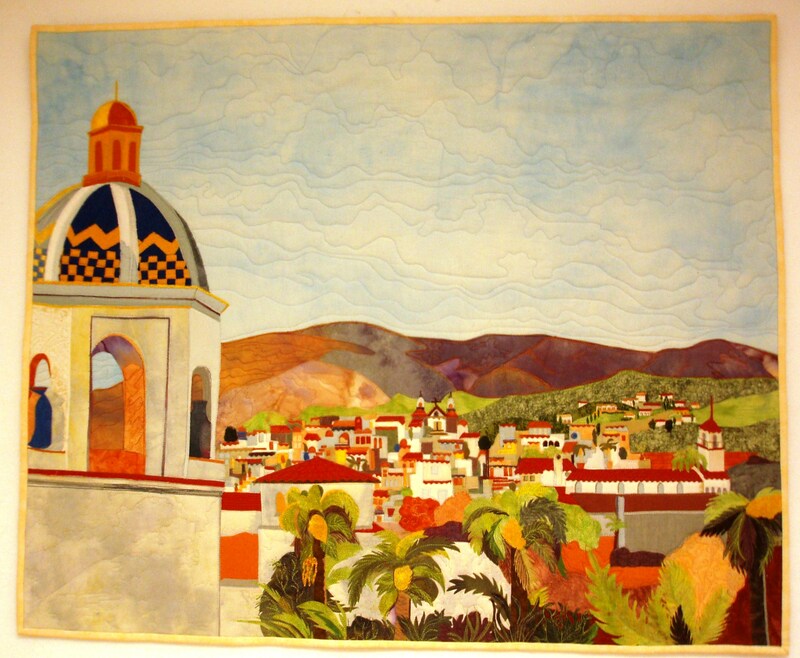 It is at the Faulkner Gallery East located at the main branch of the Santa Barbara Public Library on Anacapa St. The show is called Conceptualize, Create, Communicate. Our work is very diverse, and yet blends well together. It is an absolute splash of color, texture, pattern and form. Please try to come and see our work during the month of March. Here is a photo of my newest quilt. It is entitled Grateful Dance. I created it in commemoration of my two hip replacements and in gratitude that I have mobility again. My inspirations were the skeletons from the Dia De Los Muertos tradition, and an image I saw on a T shirt of the Virgin of Guadalupe as a skeleton. The titanium hips are made of gold and silver lame fabric. This quilt got a blue ribbon at the local quilt show last week end. I am entering it in Road to California. I am also quilting the muslin base fabric as a whole cloth quilt just to practice my machine quilting skills. I will be retiring from my full time job in October and plan to return to custom machine quilting as a retirement business. 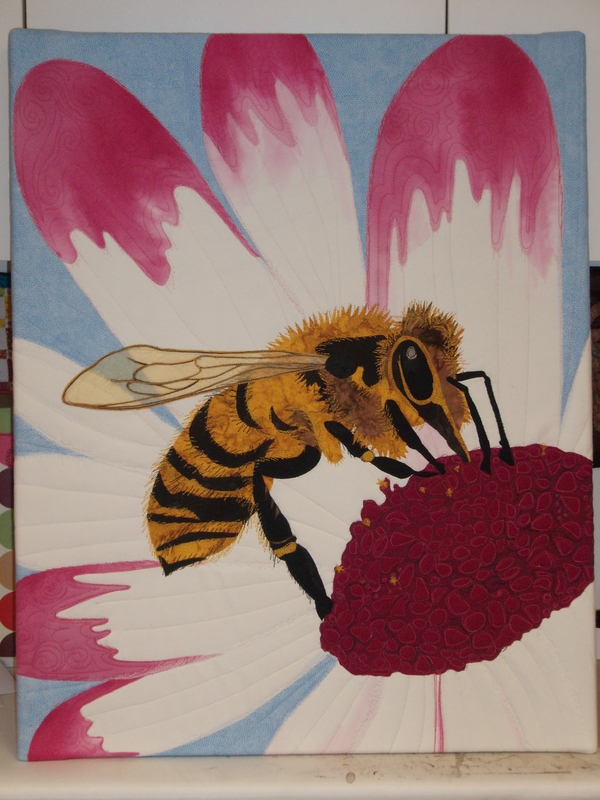 I feel that I need to hone my machine quilting skills because it has been a long time since I quilted full time. This photo doesn’t show the border, which is very cool. I will take another pic with the border on soon. 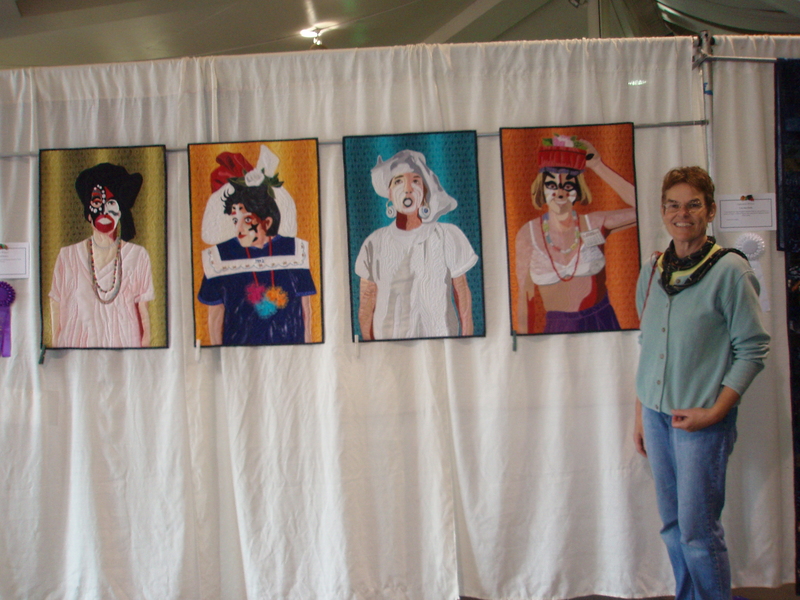 Actually I talked to my friend Judy Rys about taking a photo of the quilt for me. 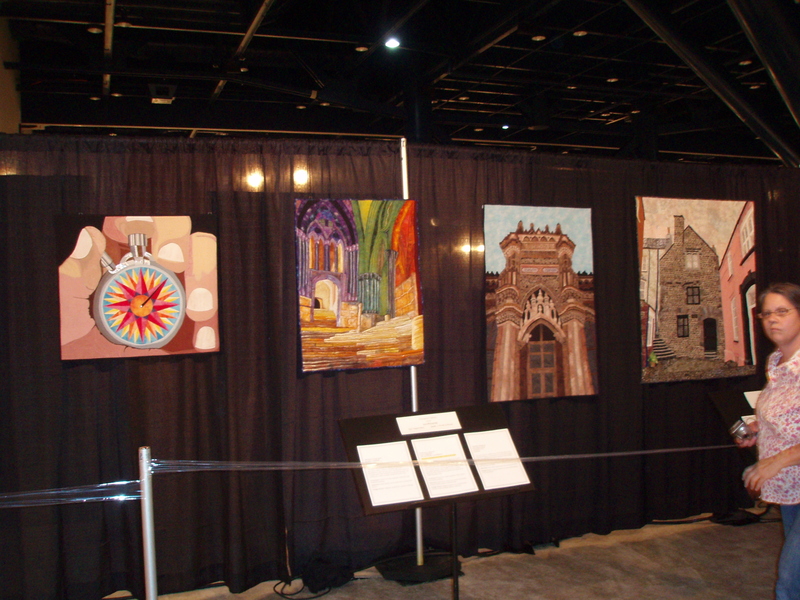 I had two quilts accepted into Road to California this year. 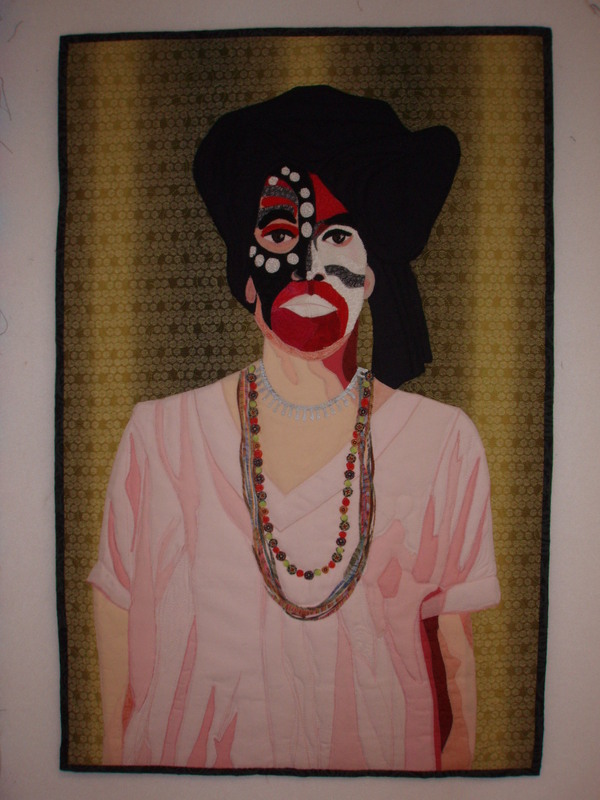 One is a conglomeration of my Wild Women series, sewn onto a black background. The other is the Santa Barbara Riviera. The show is next week end. I am going to drive down to Ontario on Tuesday and take two classes from longarm instructors Pam Clark and Jamie Wallen. Then on Friday, I am taking a class from Yvonne Porcella who is coming to our guild, then on Saturday, going back to Ontario to see the show and take a class from Pamela Allen. Phew… I won’t know if I am coming or going by next week. I finished a piece for the Fibervision alphabet challenge. My letter was B and the peramemers were to create a piece that would be displayed on stretcher bars 24×30. I am really happy with how my piece turned out. Here is another photo of my Mariner’s Stopwatch hanging at the Houston Show. I met my friend Martha there and we had a wonderful time both at the show and with one another catching up on the past year or so worth of conversation. I made halloween costumes for the grandkids. I never did get a good photo of the two of them together in their matching clown outfits, but here is a great one of Atticus in his. We went with them to trick- or- treat at some of the North Beach merchants. 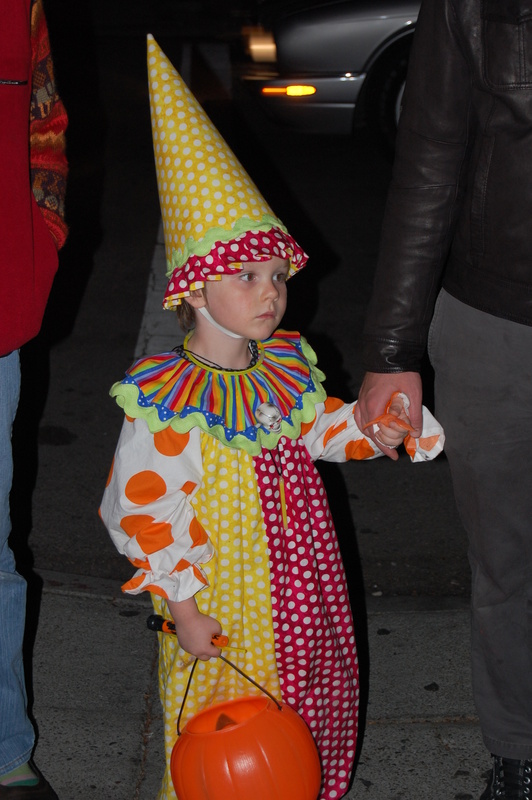 Atticus did not want to wear his clown hat, but when his dad told him that if he wore the hat, he would get more candy, on went the hat. Pretty cute. I am seeking input for my George Bush quilt. 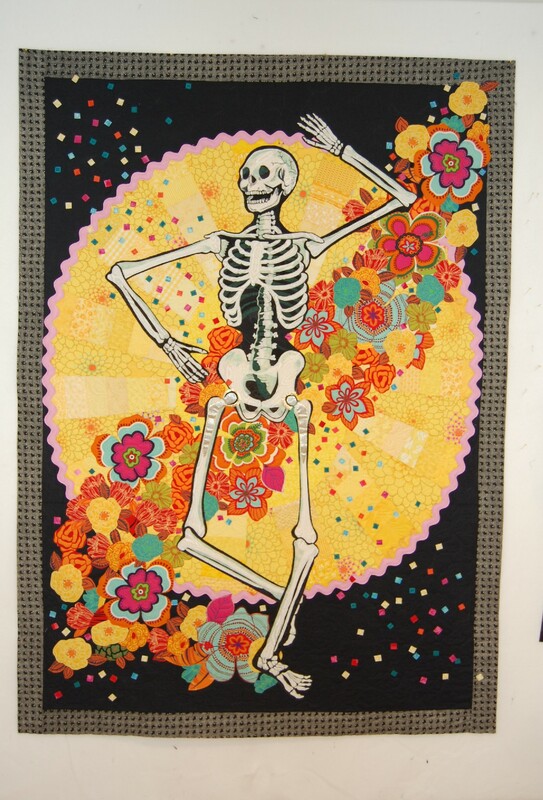 Anyone who would like to contribute a quote or a fact that I can use on this quilt, please reply. I do not know where I am going with it, but I have some ideas and would like to incorporate words with images. All help is appreciated. OK, scroll back to the post that I left entitled rejection. 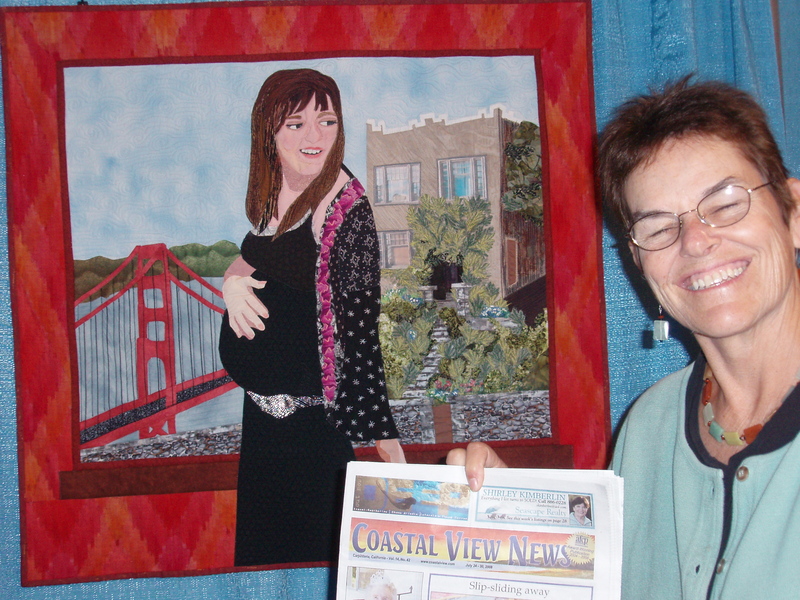 I wrote yesterday that I was going to be included in the studio Tour of the Carpinteria Valley Arts Council. I got a letter stating that they were having a show for the month of May that would include work by the artists participating in the Studio Tour ( includes a reception)- little gallery but local and cute. The same gallery that rejected the Wild Woman #1 piece that I now am entitled to enter in the show… Perseverence… or luck. I am so excited!!! The show will be at the former Step One Gallery now renamed 855 At the Arts Center. It is on Linden ave in Carpinteria. It opens on May 2 with an artist reception on May 9 from 5:00-7:00.
another piece that is in progress… forever? This is a card I found in a bookshop in Victoria BC. This is the image I made to use in a design similar to this card. I started it two or three years ago, and just can’t seem to finish it. 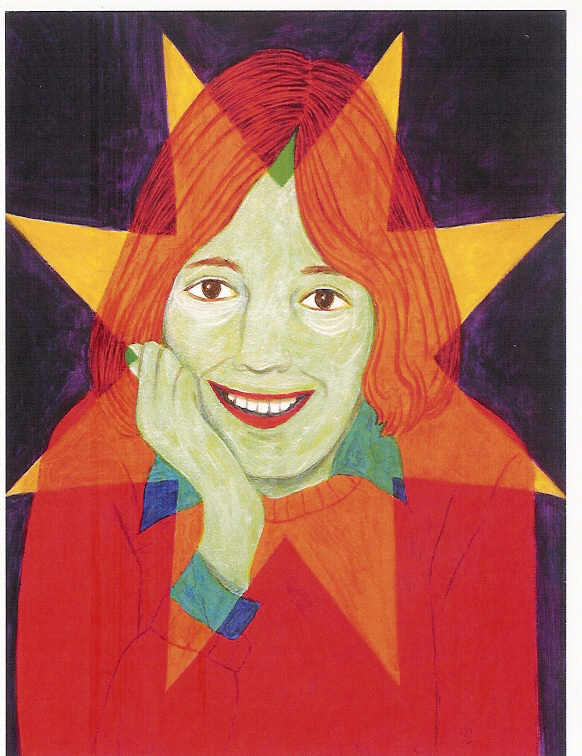 It is based on a photo of my best friend Martha, and somehow the shadow and light did not work. It’s no wonder that this piece does not work. I have never had a class in shading or light source, I just know that it is important to get it right and maybe that is why I just can’t finish it. However, I just can’t cut it up either. I think there is something to learn from this piece, so it still hangs on my wall in my studio. Here’s #2 in the Wild Women series. I have finished the composition and am working on the threadpainting and the details. I am happy with how it is turning out. I especially like the highlights on the arm. When I walked into the studio this afternoon and looked at what I had done last week, I was disappointed in the arms because they looked so flat. I tried that little light piece and it was not enough. When I repeated the thin line in orangey fabric, it worked just fine. I will get the same thread that I do the face with and highlight it a little more with thread. It does not take that long to do these, what takes a long time is the getting around to doing them. Hence the 10 minutes here, 10 minutes there. I hope to have them done before September. Last night my husband was watching a very scary video, and when he watches something I do not want to see I usually come out and sew. But just hearing the scary music from the video and the screams and all, I was too scared to walk across the driveway ane be here all by myself. What a baby… It was written by Dean Koonz, who writes psychological horror. I can deal with good scary, my favorite movie being Arachnaphobia, but if it is too close to reality, I get nightmares. Anyway, enough said. I have entered Wild Women #1 (me) in a small show here in Santa Barbara at the Architectural Review Board’s gallery. That starts in March and runs for a month. 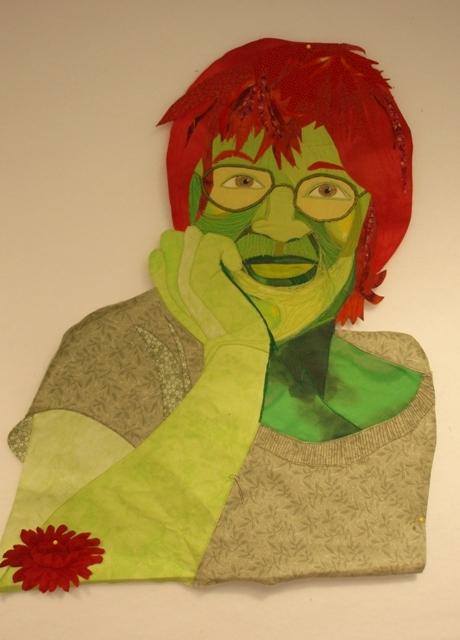 You are currently browsing the archives for the fiber art category.